Indian Institute of Management (IIM) Indore’s student initiative, i-Help organized its ‘Annual Cultural Day’ Event for over 100 students from two government schools at IIM-I campus on Thursday, 31st January. 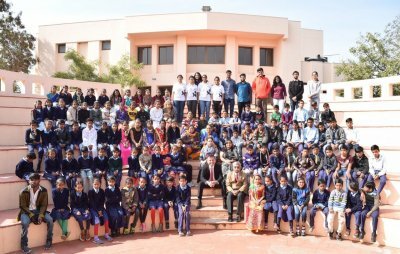 The students came from EG School, Pigdamber and GMS School, Umaria which have been adopted by IIM Indore under the School Adoption Programme as well. i-Help volunteers make visits to three government schools every Thursday to teach English and Maths to the students. The event was conducted to promote admiration of arts and culture among the students and provide them with a platform to showcase their talents. The children were full of enthusiasm with more than a dozen dancing, singing and recitation performances for the cheering audience. Mrs. Sonali, a GMS school teacher, thanked i-Help for helping these students in their education and bringing a change in their lives through continuous efforts. She also expressed her happiness as the school children are very eager to visit IIM campus to perform in this annual event of i-Help. Professor Himanshu Rai, Director, IIM Indore interacted with the students and encouraged them to study not only from the books, but also from their surroundings. He advised the young ones to remain focused on their studies and at the same time create memories during their childhood days—which help in learning and gaining experiences. Professor Surbhi Dayal, faculty mentor of i-Help also interacted with the students and inspired them to pursue their dreams. She motivated them to take part in as many extra-curricular and sports activities as possible, without losing focus on their studies.